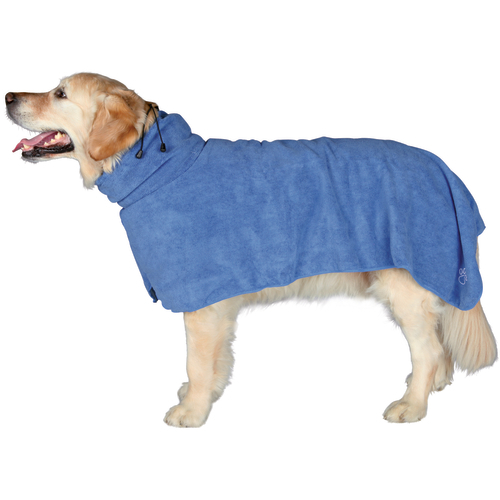 The Trixie Bathrobe is a quality, micro fibre drying coat for dogs. Great at moisture absorption, it also keeps your dog insulated & prevents cooling after he’s just had a shower or been on a wet walk. Another benefit to the Trixie Bathrobe is that it ensures your walls and furniture don’t get soiled! •	Adjustable drawstring collar and tail loop ensures a secure fit. •	Suitable for all coat types. •	Machine washable up to 60 degrees. The robe should fit loosely to allow enough space for moisture absorption. Measure from the back of the neck to the base of the tail.